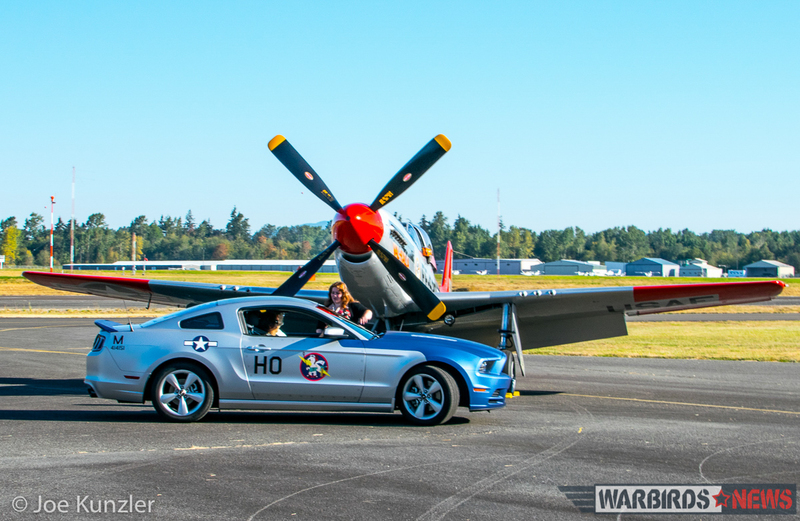 The Heritage Flight Museum at historic Skagit Regional Airport near Burlington, Washington held their sixth annual Props & Ponies extravaganza on August 20th featuring the North American P-51 Mustang alongside its namesake automobile, the Ford Mustang sports car. 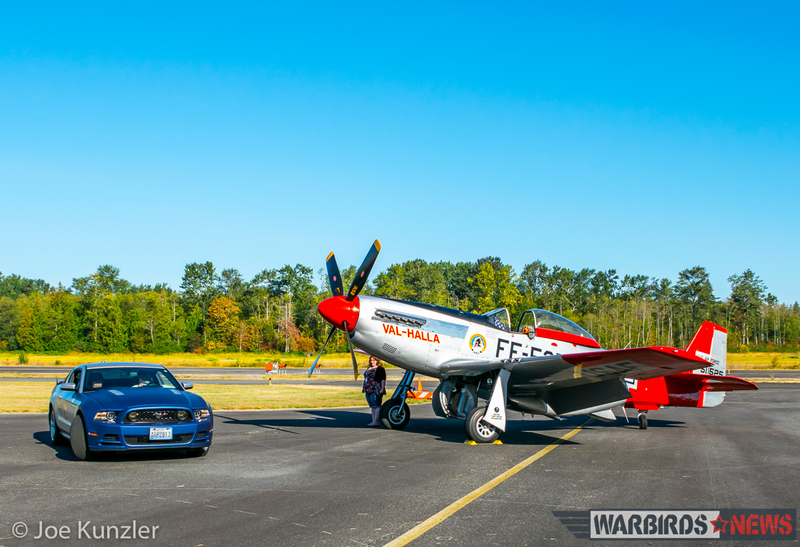 The event brought auto and aviation enthusiasts together to celebrate, as the museum put it, “the car that changed the way we drive, and the aircraft that changed the course of a war”. 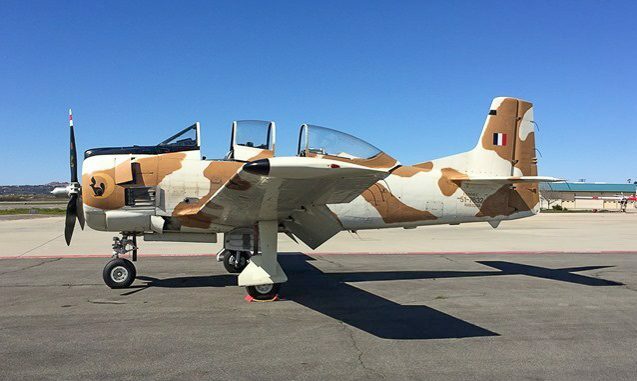 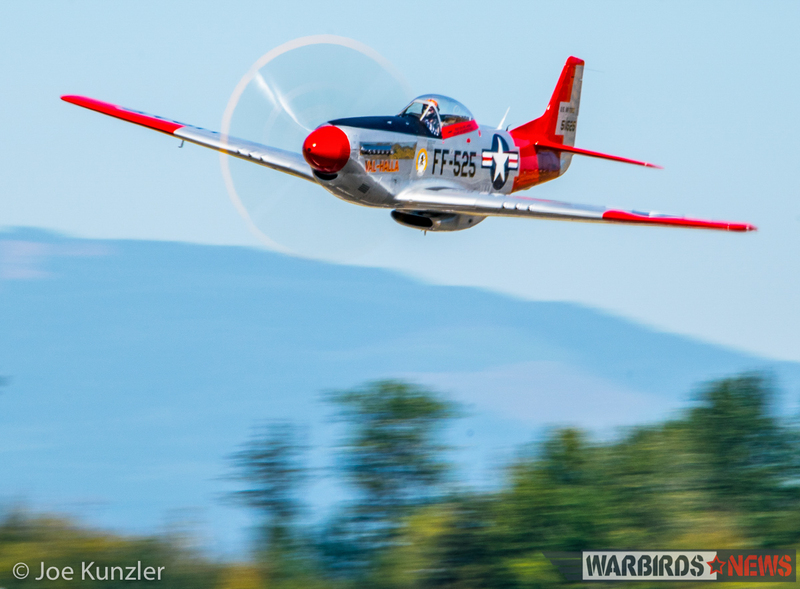 North American named their P-51 after the same wild horse, so the blend of Ford and North American Aviation Mustangs in a single show makes perfect sense in many respects. 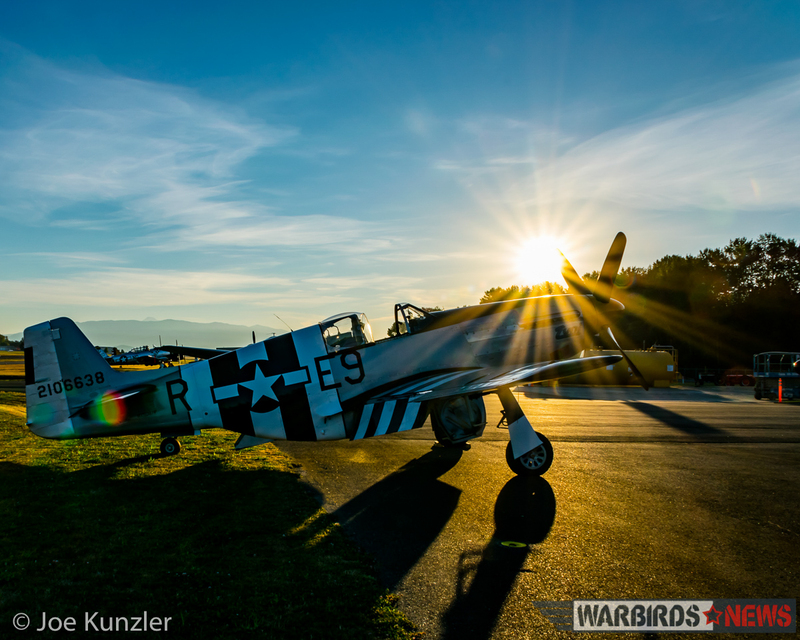 As Ford and North American P-51 Mustang fans planned their convergence upon the Heritage Flight Museum for Props & Ponies 2016, the author was privileged to have early access to the flight line to capture some unique photographs of the museum’s warbirds and the Historic Flight Foundation’s rare North American P-51B Mustang in the golden light just after dawn. 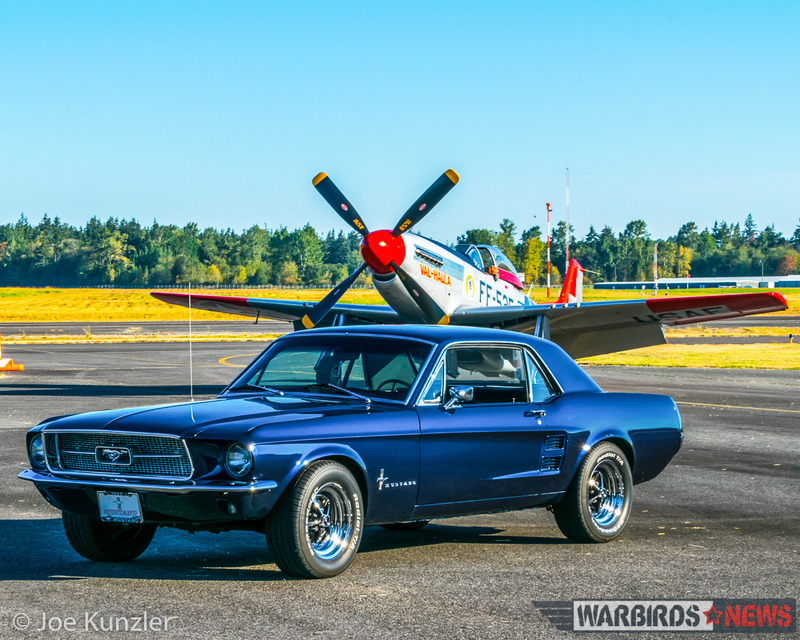 However, despite the beauty of the sunrise shoot, the most intriguing photographic opportunity at Props & Ponies was the pairing of Ford Mustang automobiles with North American P-51 Mustang fighter planes. 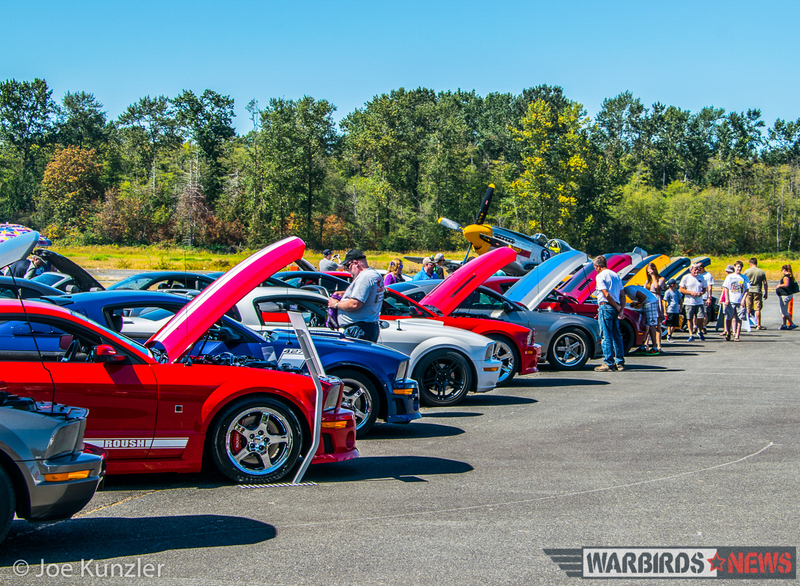 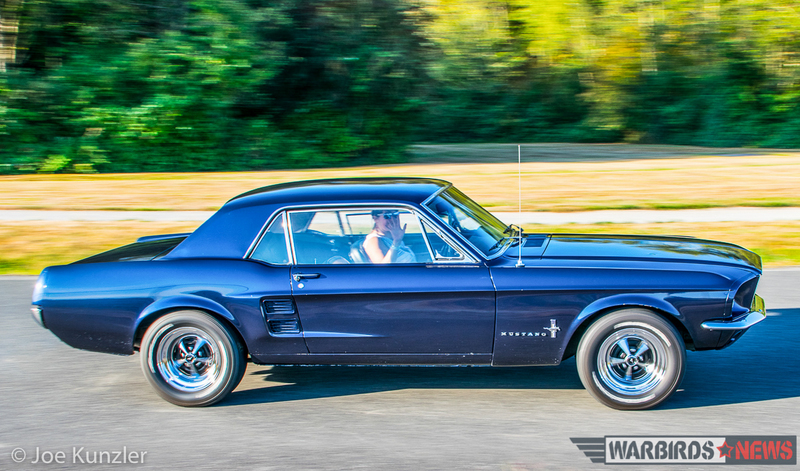 Vintage Ford Mustangs, as well as examples straight from the factory floor, were on view. 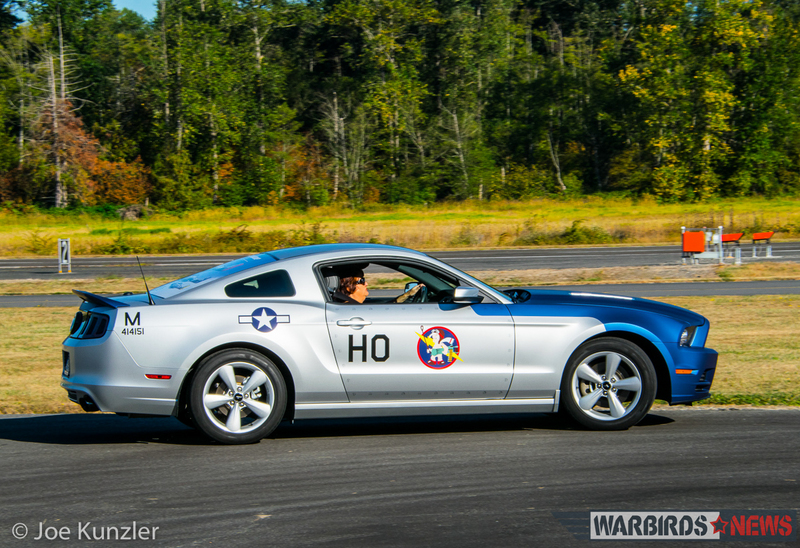 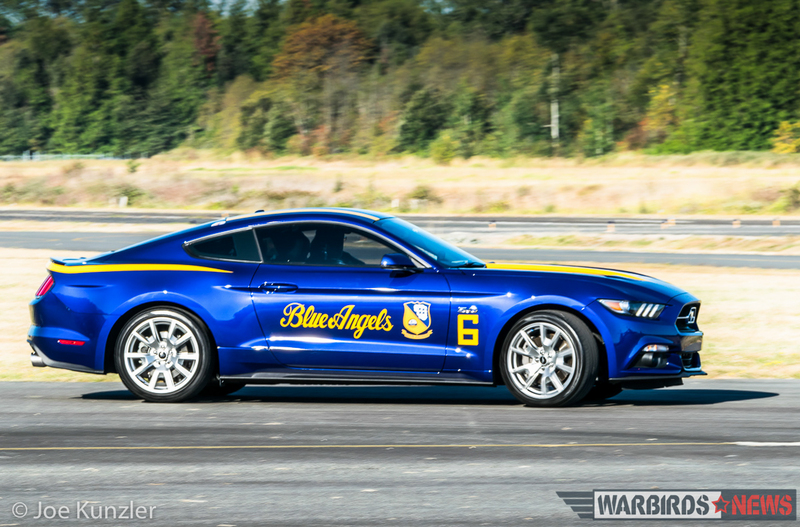 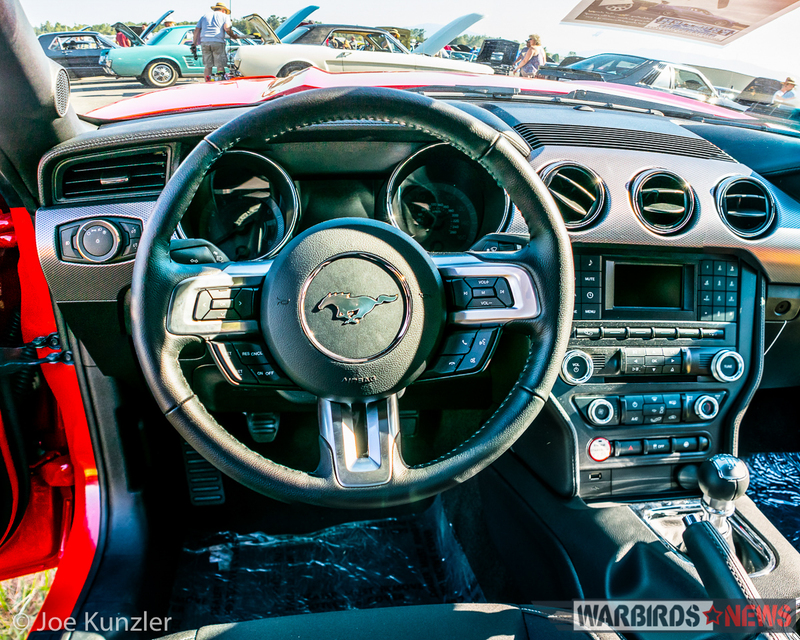 There were even a few Ford Mustangs painted up with aviation-themed paint schemes, including one marked in tribute to the 352nd Fighter Group and another feting the US Navy’s Blue Angels. 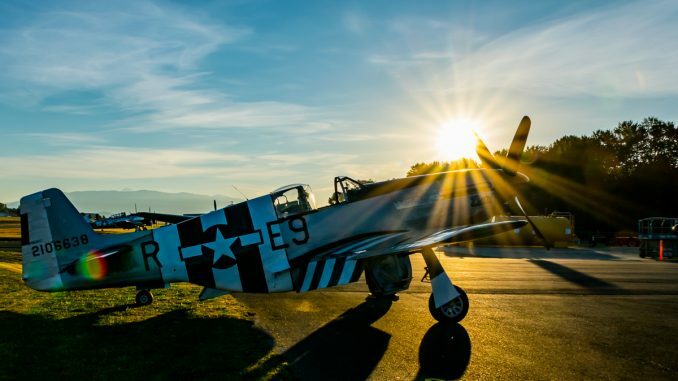 On a sad note though, during the early hours of the show, the public first heard about the passing of Ed Maloney, the beloved and legendary founder of the Planes of Fame Air Museum. 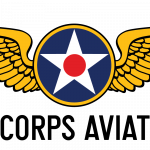 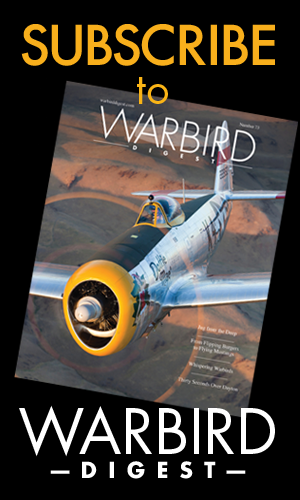 Maloney was a wonderful gentleman, and a giant figure in the warbird preservation movement since the early 1950s. 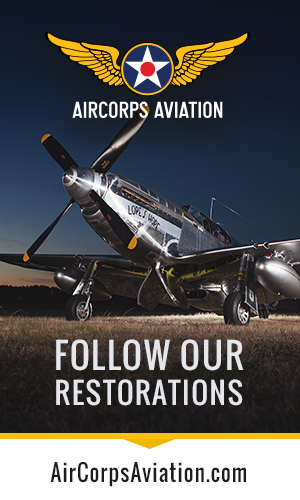 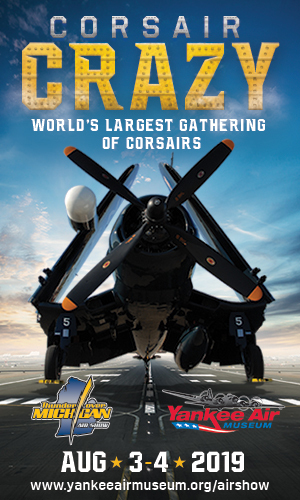 His extraordinary vision and bold action saved literally hundreds of important airframes for future generations. 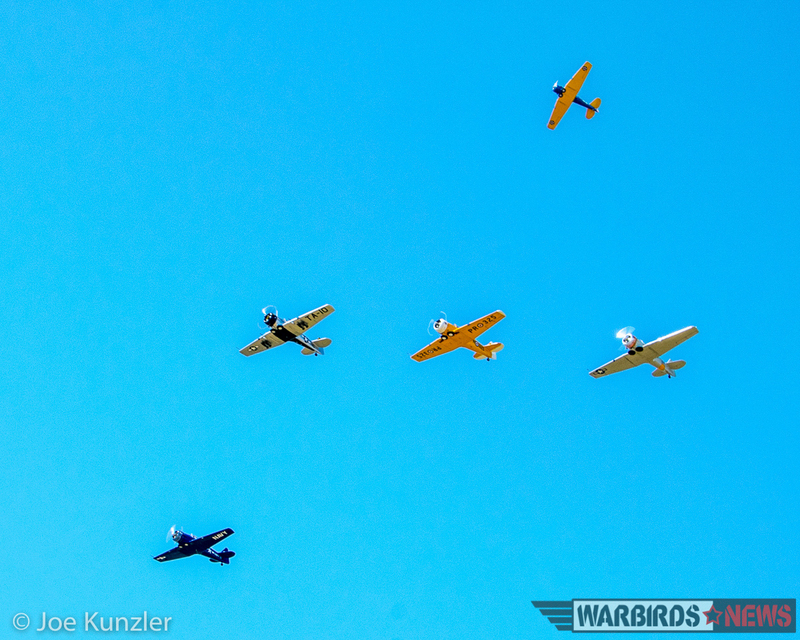 The Heritage Flight Museum quickly organized and executed a five-ship T-6/SNJ/Harvard missing man formation out of respect for the late Mr. Maloney, and this touching tribute will ring out far beyond the event itself. 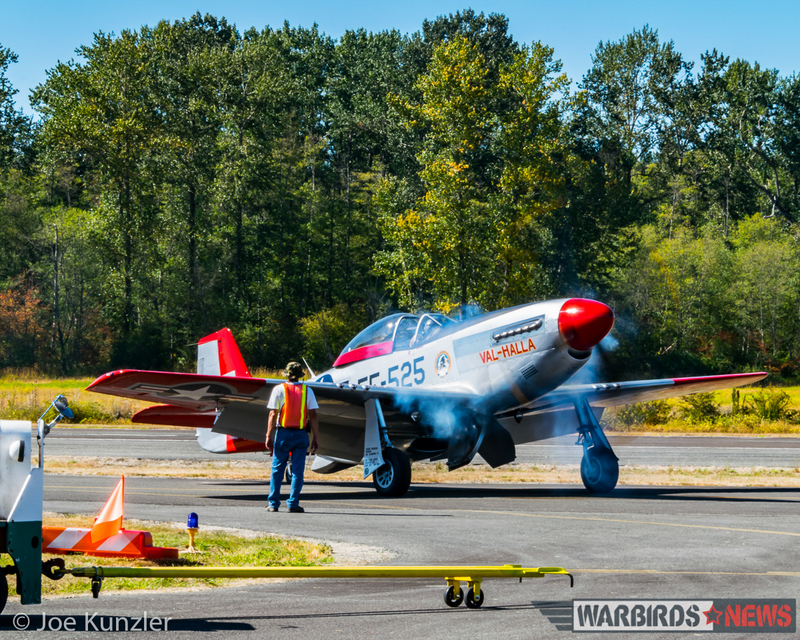 After the missing man formation, the North American trainers paraded by in a thrilling series of low approaches down the runway. 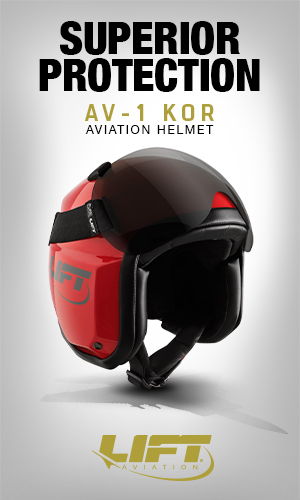 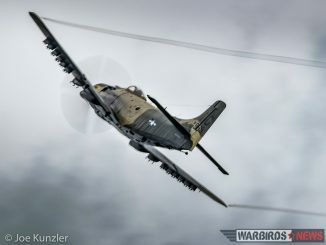 Of course, the day would have more hard-core flying. 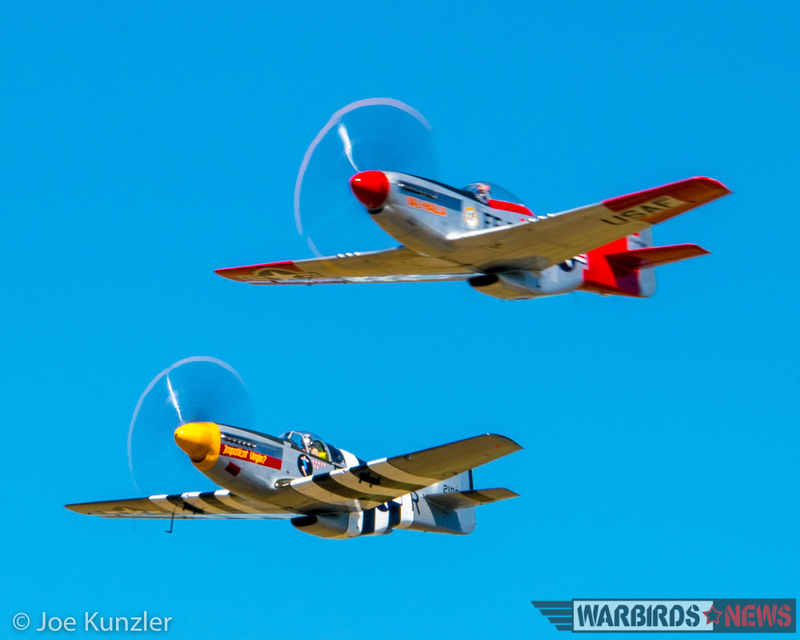 In the early afternoon, two P-51 Mustangs took off for their performance. 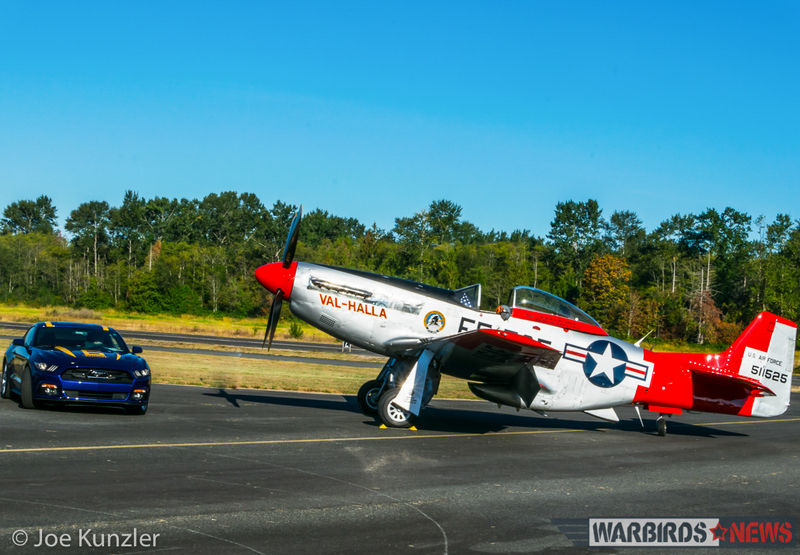 These two fighters comprised the Historic Flight Foundation’s P-51B 42-106638 “Impatient Virgin” and the Heritage Flight Museum’s P-51D 45-11525 “Val-Halla”. 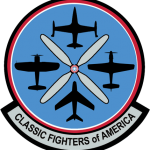 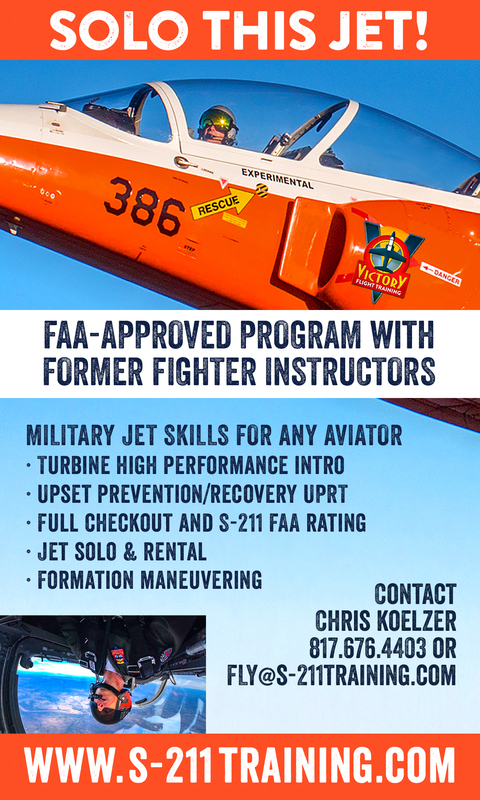 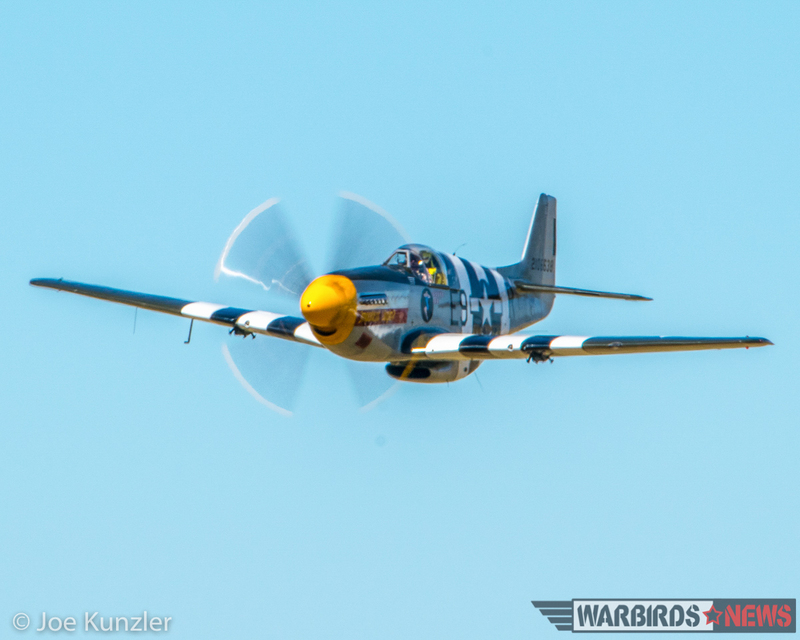 The HFF example, while essentially a new-build airframe, is based upon the mortal remains and identity of P-51B 42-106638, a D-Day combat veteran. 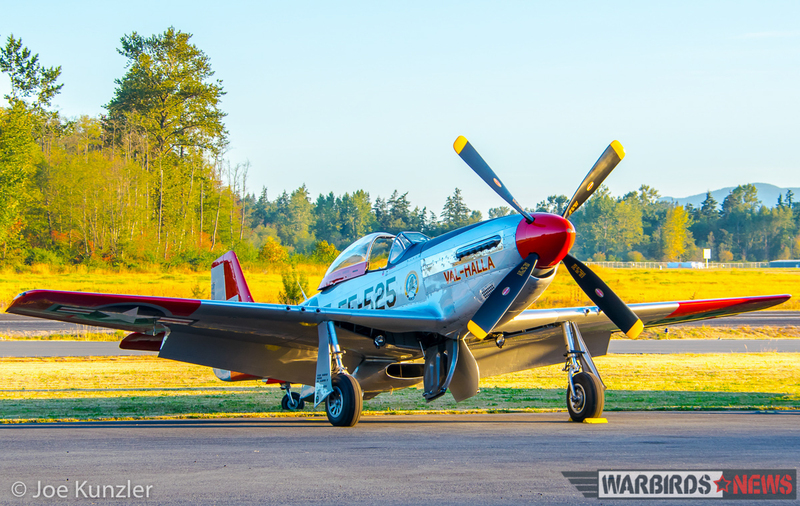 The Heritage Flight Museum’s P-51D is painted up in markings reminiscent of a Mustang that Apollo 8 astronaut and museum founder, General Bill Anders, flew during US Air Force aerial sovereignty missions over Iceland in the early days of the Cold War. 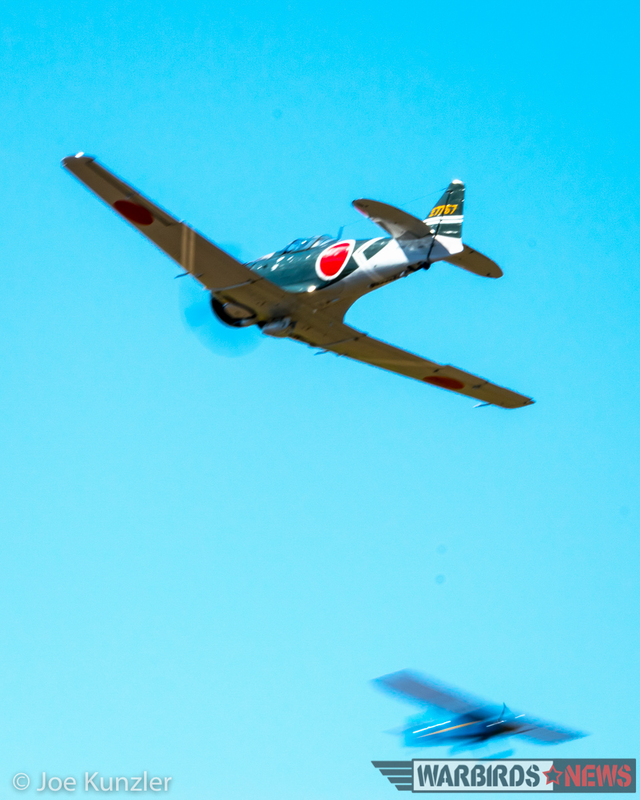 After the two North American P-51 Mustangs finished their demonstration, brothers Greg and Alan Anders performed a re-enactment of the famous encounter between an Imperial Japanese Navy Mitsubishi A6M ‘Zero’ and an American civilian Interstate Cadet that took place during the melee near Pearl Harbor on December 7th, 1941. 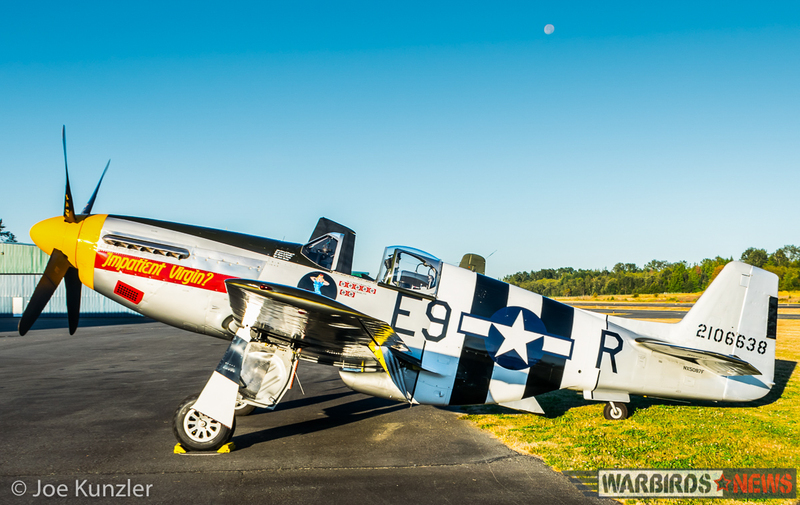 The museum’s Interstate Cadet, registered NC37266, is the actual aircraft from that historic event. 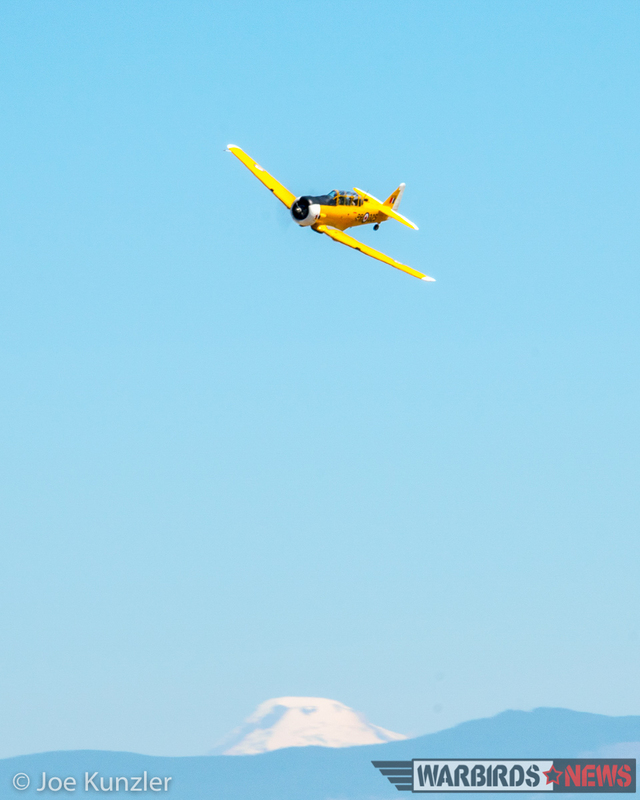 Cornelia Fort was flying with her flight school student aboard on that fateful day, and somehow managed to avoid being shot down. 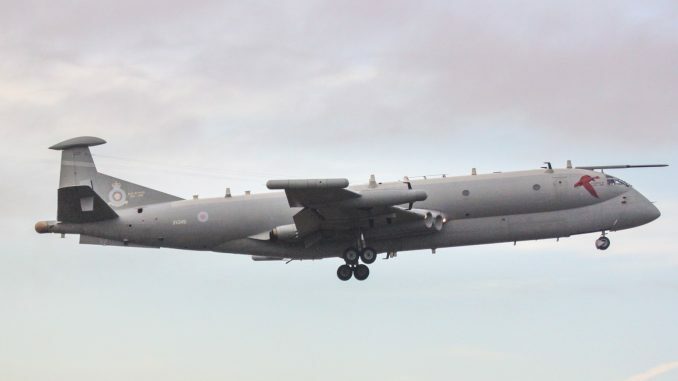 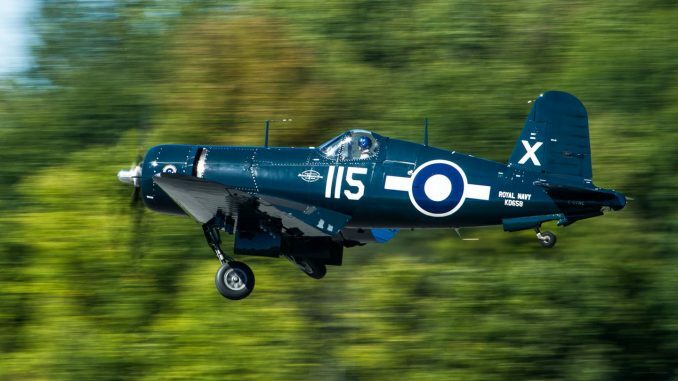 For more on this fascinating story, please see our previous article HERE. 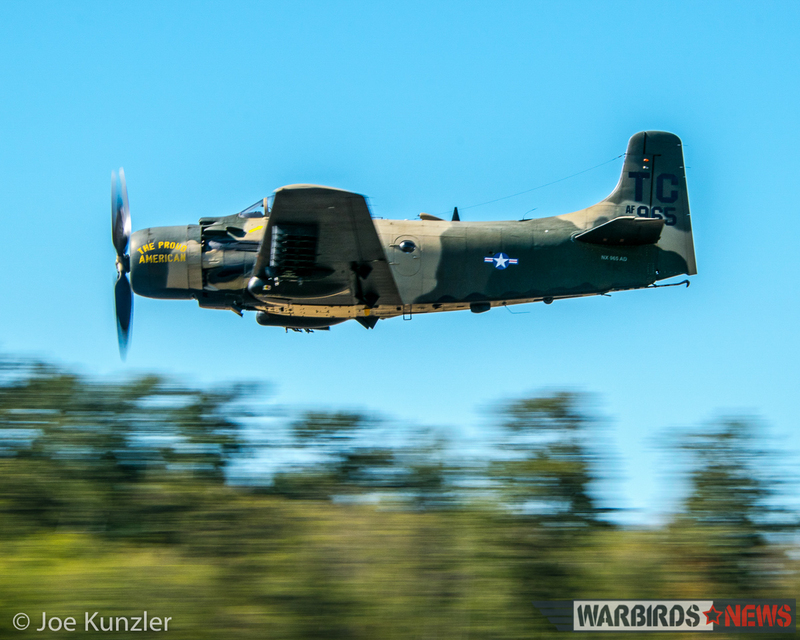 The festivities ended with the two P-51 Mustangs forming up with Heritage Flight Museum’s Douglas A-1 Skyraider for one last flypast. 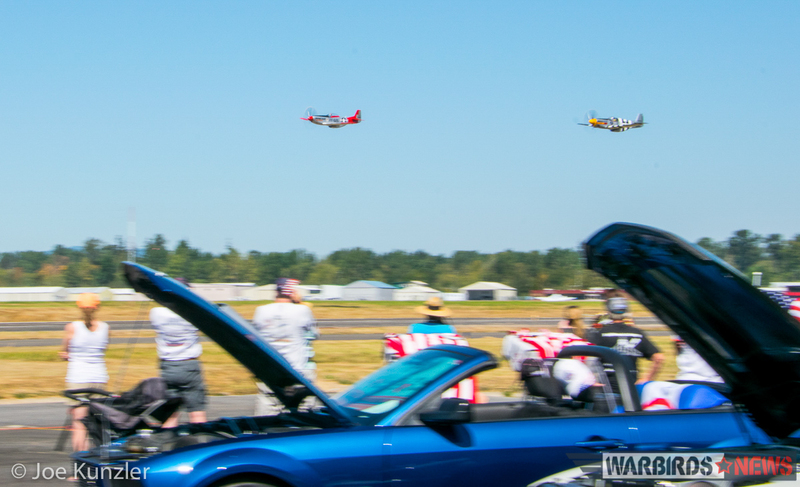 Air show visitors thrilled to the sound of powerful engines as the flight roared past the crowd line to close out the day. 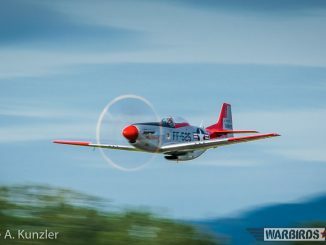 After the three aircraft landed, the HFM display ended joyfully to the rumbling music of around a hundred Ford Mustangs departing Skagit Regional Airport. 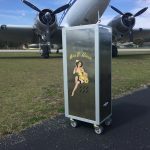 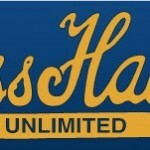 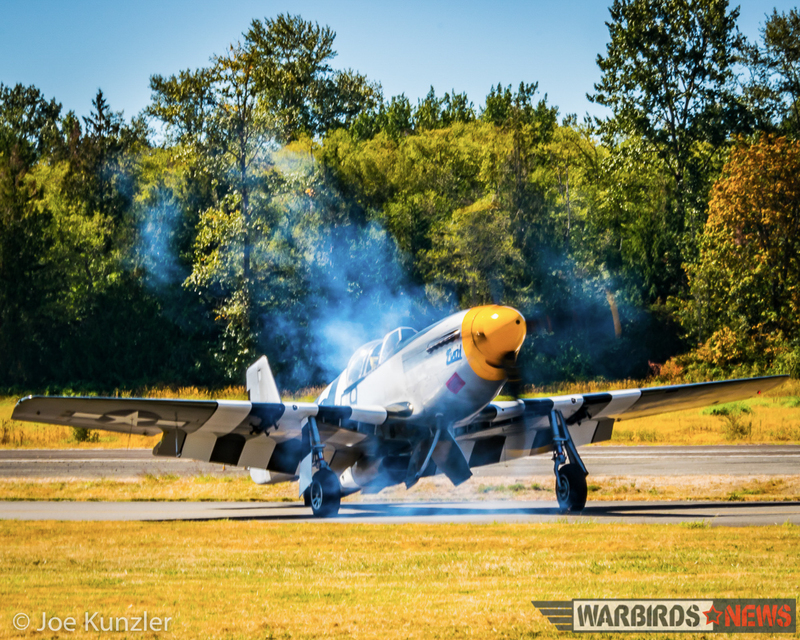 The Heritage Flight Museum’s goals for the day of providing “a unique opportunity to bring together folks who like cars, aircraft and history, and to support the mission of the Heritage Flight Museum – ‘Honor Veterans, Keep History Alive” came to a successful conclusion. 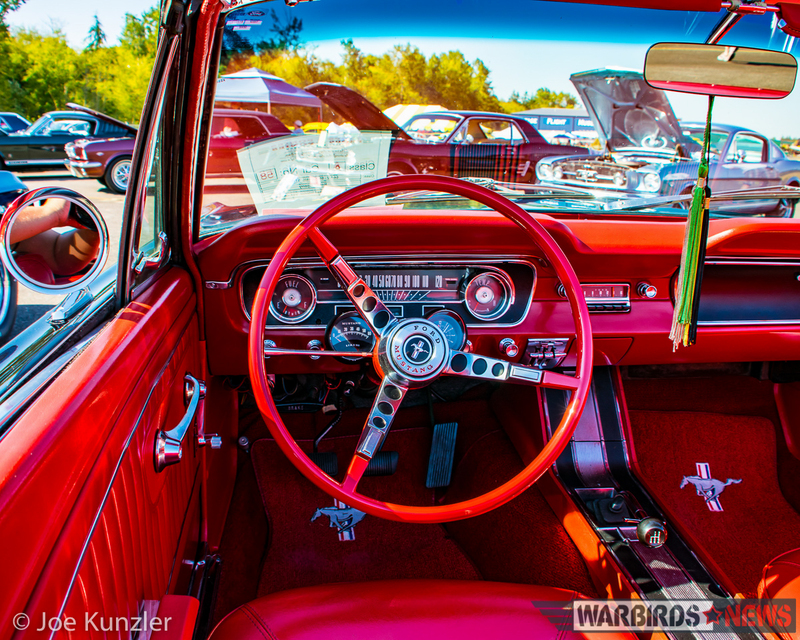 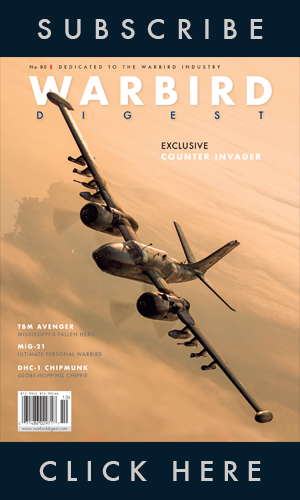 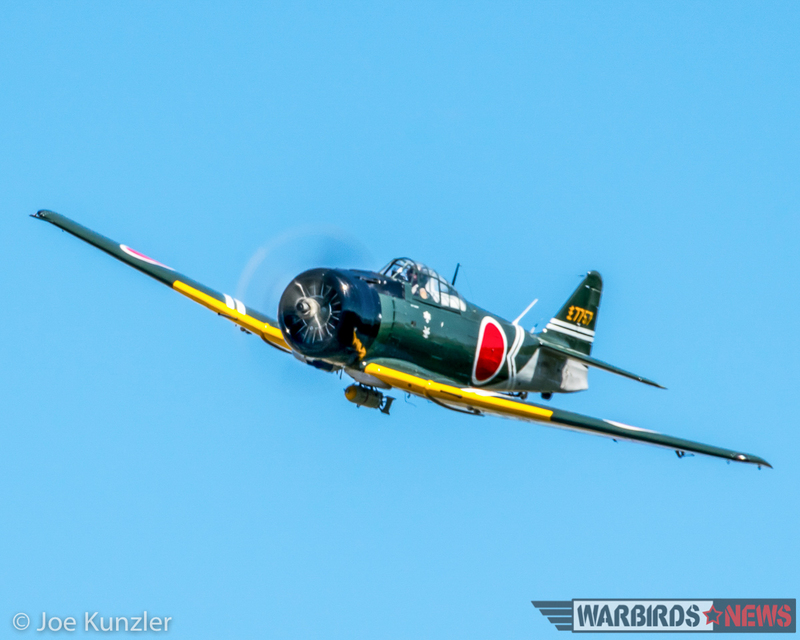 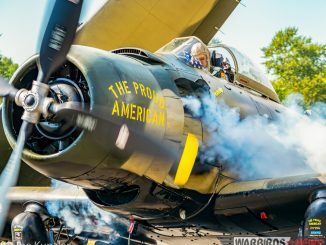 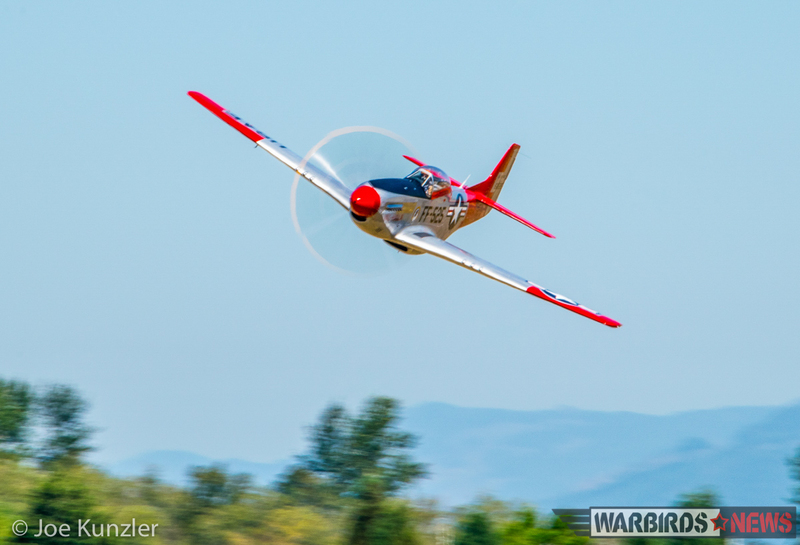 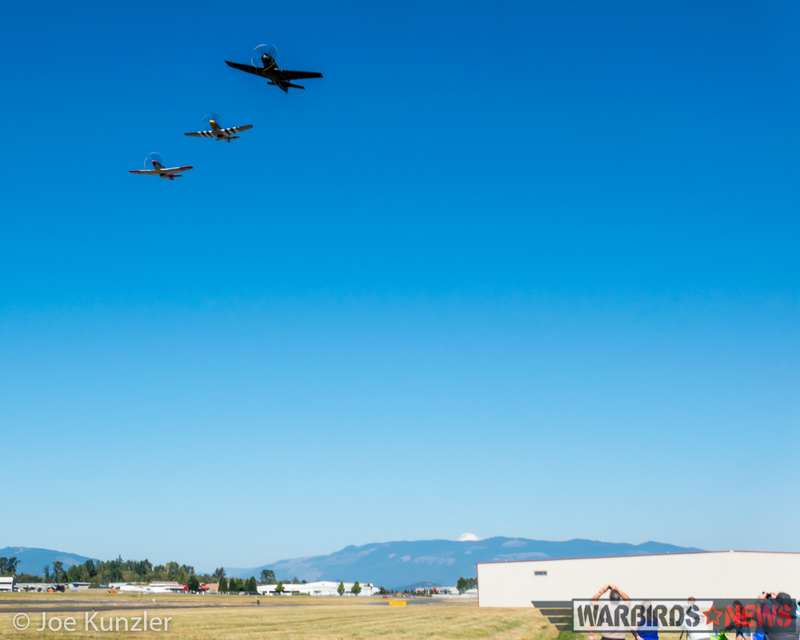 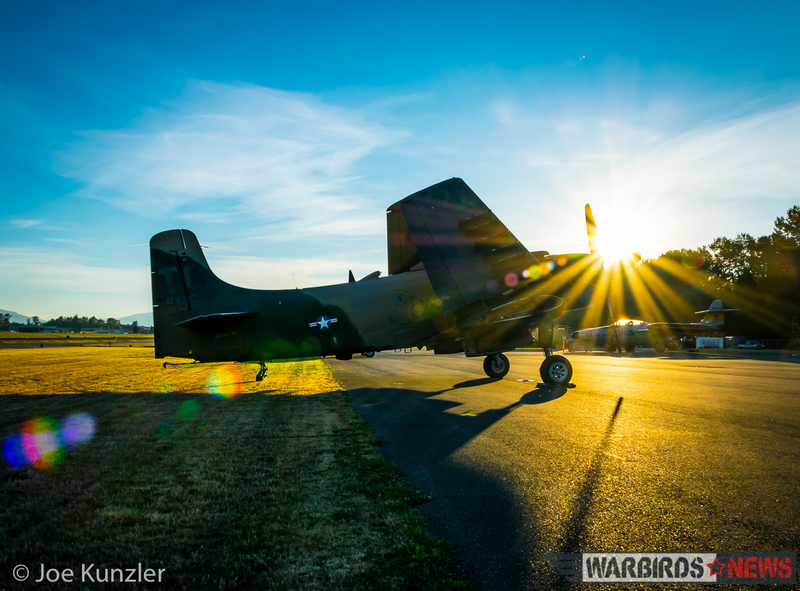 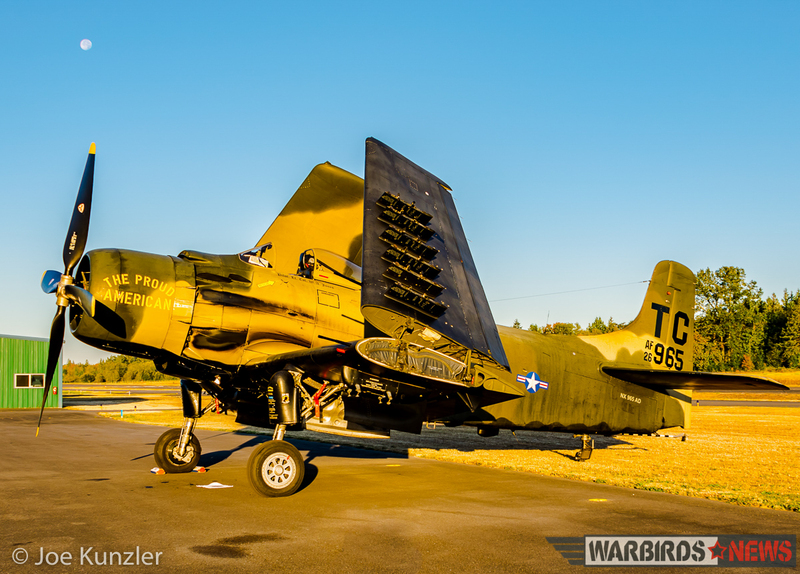 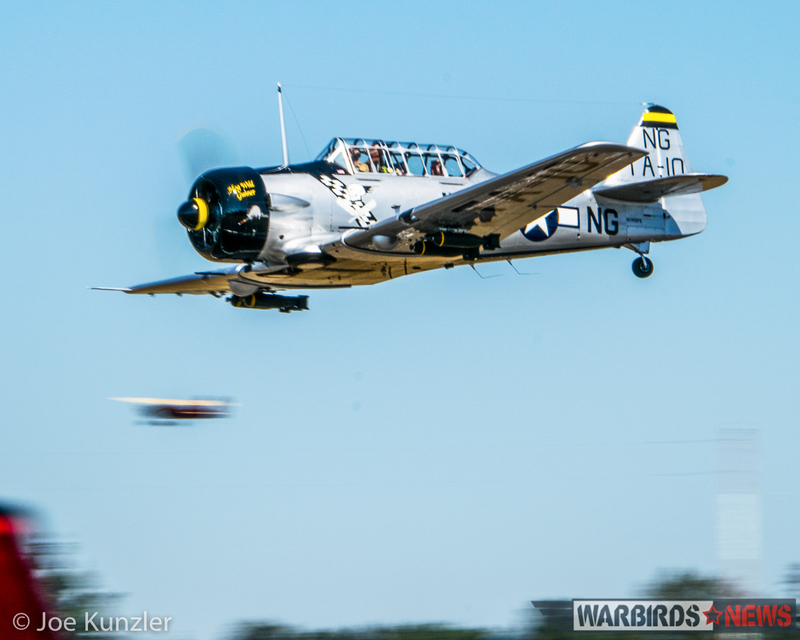 WarbirdsNews would like to thank Joe Kunzler for the hard work he put into this article, and capturing some lovely images from what must have been a marvelous day. 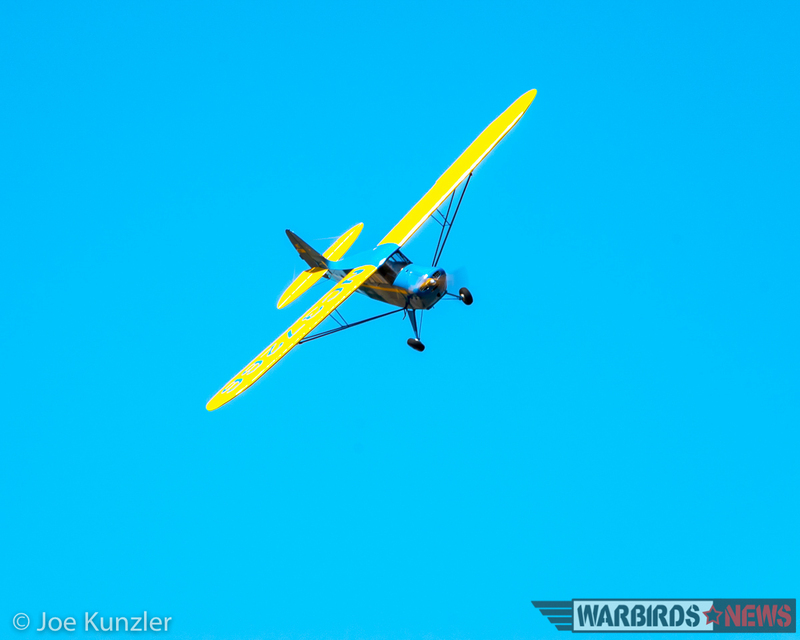 The event was doubly special for Kunzler as Dr. Anne Will, his recently retired community college professor of American History, attended with some her family to enjoy a slice of the day’s festivities. 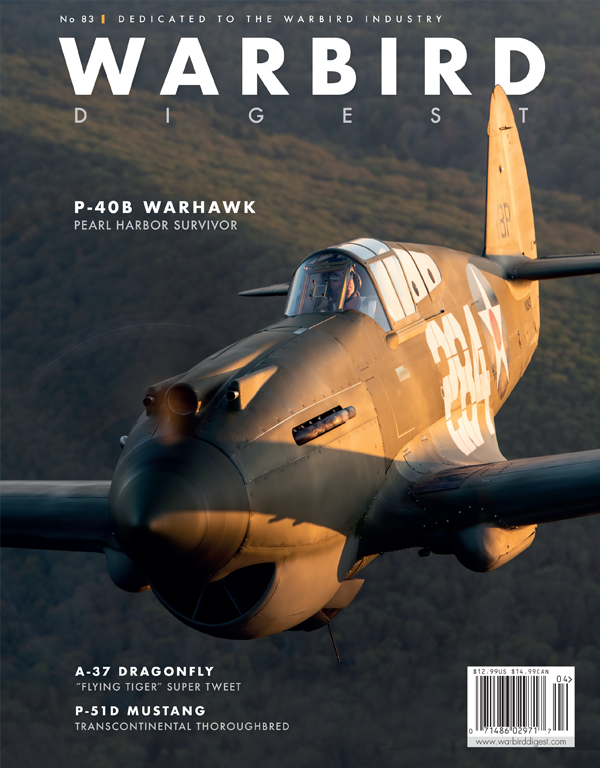 Joe would like to dedicate this article to Dr.Will whom he credits with giving him such a strong foundation in historical analysis skills. 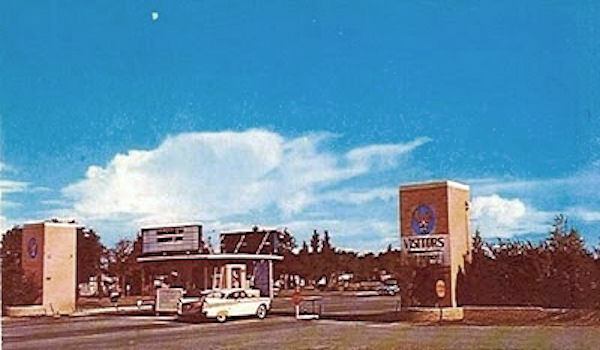 Roger White Rock BC ?